Sydney forklifts supplies forklifts and parts for forklifts. Brian and Diane Talbot, owners and operators of Starline Forklifts have over 25 years of experience in the industry. 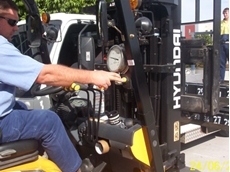 With such a wealth of knowledge we can full fill all your forklift needs. New and used forklifts. Forklifts and Industrial Equipment. With a Licenced Forklift Technician, All makes and models of any material handling equipments and machinery, Quality service and repairs second to none. For on site service and repairs call us. Liftech Handling & Access hire, sale and repair access and lifting machinery and equipment including forklifts, forklift attachment, scissor and boom lifts. Liftech Handling & Access hire also offers a range of pallet jacks.